African Studies and the Music Dept. 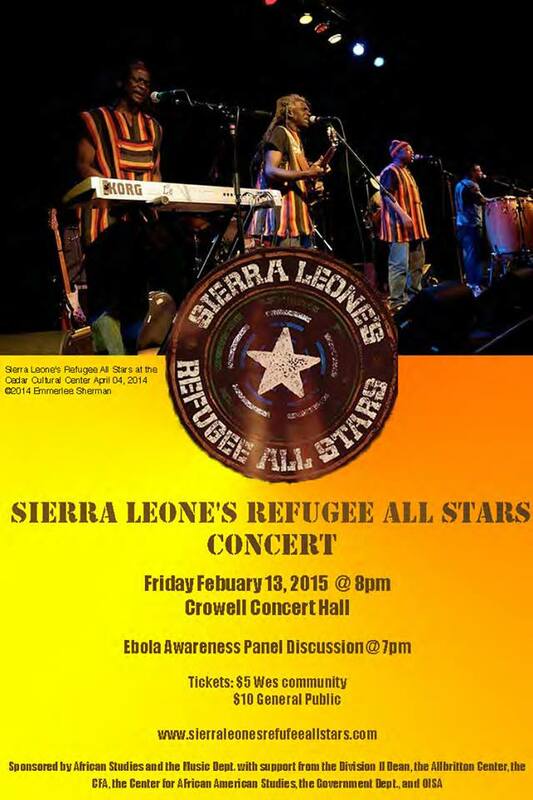 are bringing Sierra Leone’sRefugee All Stars (SLRAS) to campus this Friday. They are a major group on the world music circuit and were featured in an acclaimed documentary (More about the documentary can be found here). They are now touring the U.S. to promote awareness about Ebola and fund raise for Ebola relief. The Pre-concert panel is at 7PM in Crowell Concert Hall followed by the Sierra Leone’s Refugee All Stars Concert at 8pm. Posted by D in Culture, Events, Music and tagged concert, Sierra Leone's Refugee All Stars on February 13, 2015 at 11:08 AM.